NetLingo has been featured three times in The New York Times! Once in an article on the cover page of the Arts section as one of the best online slang sites in "When the Geeks Get Snide; Computer Slang Scoffs at Wetware (Humans)." NetLingo was also referenced by Mr. William Safire in his syndicated column, this one was called "Qualassurepurp." And NetLingo was referenced in a special feature called "Geek Speak: A Peek Into a Cruel World." NY Times "When Geeks Get Snide; Computer Slang Scoffs at Wetware"
NetLingo was featured on the front page of The Wall Street Journal Lifestyle section in a fantastic article called "Quick! Tell Us What KUTGW Means!" (It means Keep Up The Good Work ;-) It also said "One reason for the surge in texting abbreviations - more than 2,000 and counting, according to NetLingo - is the boom in social-media sites like Twitter, where messages are limited to 140 characters. Text messages, too, are limited in length, so users have developed an alphabet soup of shorthand abbreviations to save time, and their thumbs." The San Francisco Chronicle featured NetLingo in in an article on the cover page of the Arts section called "Wanna Hook Up." NetLingo was featured in The Miami Herald in a feature article entitled "Surf On Over." The Boston Globe featured NetLingo twice, once as the Web site for parents and teens to use, in an article called "Internet Harassment Can Be a Kid's Virtual Nightmare" and later in the article "SWTHDTM = So What The Heck Does This Mean?" Featured in USA Today in the Parent Smart section, NetLingo was the Web site to go to for parents in an article called "Up on teen text lingo?" A "Hot Site of the Week" by USA Today, they told readers to "Speak geek with NetLingo!" USA Today "Learn the Lingo"
NetLingo won the "Best dot-com Inspired Words and Phrases" in the Best of Seattle Editors' Picks. The King County Journal featured NetLingo in a story called "Yo, Grads, It's Time for an Inspirational Chat." The Seattle Post Intelligencer featured NetLingo three times! Each time we were part of a cover story in their Lifestyles section: Once in an article called "Kids led the way, but texting's GR8 for all." Another time in an article entitled "If You Want To Protect Your Kids, Get with the IM Lingo," and also in a story called "Hot Spot Sites You Love." NetLingo is featured NetLingo in a story called "Say What? Interpreting Online Lingo." NetLingo was featured in The London Times as one of the Top 50 Web sites! They said "Fast relief from confusing Internet jargon." Featured in Australia's The Age, they said "Web dictionary NetLingo deciphers hundreds of the cryptic codes, with some of them as ridiculous as they are confusing - such as 2BZ4UQT (Too Busy for You Cutey), @TEOTD (At the End of the Day) and P911 (Parent Alert)." The TriValley Herald in the Bay Area featured NetLingo in a story called "Internet Users Breed A Strange New Language." TriValley Herald "Internet Users Breed A Strange New Language"
NetLingo was featured in an article in The North County Times / The Californian serving San Diego and Riverside Counties, entitled "Seminar Warns of MySpace Dangers." NetLingo was featured exclusively in the sidebar as the website to visit gor an extensive glossary of text-messaging codes! This is part of a larger story called "Keeping up: U spk txt? Older cellphone users are embracing text messaging to keep in touch with kids (or grandkids) and jobs." NetLingo was featured in an Extra! story in The Rocky Mountain News in an article called "R U A SNERT?" NetLingo was featured in a top story in The Orlando Sentinel in Florida in an article called "Do you speak Net? Website answers parents' SOS!" The Seminole Voice, serving Greater Oviedo and Winter Springs in Florida, ran a special story about social networking sites and said NetLingo is the place to go to learn about text shorthand and Internet definitions. NetLingo is among fine company in this article in The Richmond Times Dispatch, including Urban Dictionary, Wikipedia, and NoSlang, called "Stumped by teen slang? Turn to the Web for help!" The Arlington Star Telegram covered NetLingo in an article called "Text Message Assignment Pushes Parents' Buttons." NetLingo has been featured three times in The Kansas City Star! In an article entitled "Real Men Know It's Swell To Cry," in an earlier article called "Send IM when U get this," and in a previous top story called "Message Mayhen: Those Acronyms Mean Something to Teenagers." NetLingo was featured in The Ojai Valley News of California in an article entitled "NetLingo Internet Guide Aims to Demystify." Ojai Valley News "NetLingo Internet Guide Aims to Demystify"
The Times Beacon Record Online of Huntington on the North Shore of Long Island, New York covered NetLingo in a story called "Cyberbullying Expert Joins Public School System." The Star-Gazette of New York covered NetLingo in a story called "Get Hip to IM Lingo." NetLingo was featured in the Maine Sunday Telegram in a story called "Local Internet Advertising Delivers Precision Targeting." The Nashua Telegraph of Southern New Hampshire featured NetLingo in an article entitled "Web site GPAC (Gives Parents A Clue) on Net lingo." NetLingo was featured in the Burlington Free Press in a story called "Keeping Kids Safe Online." NetLingo was featured in the New Haven Registrar in a story called "Text me if :) makes you LOL or pull out your hair - JK." NetLingo has been featured three times in the The Portsmouth Herald! Once in a story about "Internet Safety," another time Erin contributed to a story called "Professor Worries that Cell Phones are Dictating Our Lives," and earlier, Erin was quoted in a feature story "Parents Know What Your Kids Are Talking About Online." NetLingo was featured in Foster's Daily Democrat in a lead story called "Warning! Teen Chatting"
The Philadelphia Inquirer featured the NetLingo Web site and the book in an article entitled "New Book and Site Offer Help Translating Computer Buzzwords." Philadelphia Inquirer "New Book and Site Offer Help Translating Computer Buzzwords"
The Pittsburgh Post-Gazette featured NetLingo in a lead story called "P911: A Guide to Teens' Online Shorthand." NetLingo was featured in The Detroit Free Press as part of a cover story entitled "LOL: Texting Gives License Plate Letters New Meaning." NetLingo was referenced in The Detroit News as part of a cover story entitled "Net-speak." NetLingo provided insightful information to parents for an article in The Milwaukee Journal Sentinel called "Have Kids Chat Less? LOL!" The Fergus Falls Daily Journal in Minnesota featured NetLingo in a lead story called "Parents Hear Dangers of Internet." The Naperville Sun in suburban Chicago featured NetLingo in a cover story called "On a Trip to the Internet, Be Sure to Bring Your Manners." NetLingo was featured in Pantagraph.com, the online division of the newspaper in central Illinois. The article is about "Text Talking: Teens Get the Message in Own Form of Shorthand." Erin Jansen was featured in an article in The Clarion Ledger of Jackson, MS entitled "Putting Text in Context." NetLingo was featured in The Walker County Messenger of Georgia in an article called saying "State Agency Offers Internet Safety Advice." NetLingo was featured in the Clanton Advertiser in Alabama as the site to go to in a special tutorial when "Attending Classes on Cyber Crime." NetLingo was featured in South Carolina's The State in an article called "Online: Put On a :-) Face." NetLingo was featured in a cover story in the San Mateo County Times and then on Inside Bay Area.com - the article, called "Elementary: Networking sites not always OK for kids" identified the NetLingo Top 50 Internet Acronyms Every Parent Needs to Know list as a helpful resource. NetLingo was featured in South Carolina's The Daniel Island News in an article called "Kids, Cell Phones & Text Messaging." The Nashville City Paper picked NetLingo as their Web site of the week. They say "Jive with the best techie at www.netlingo.com." Right on! NetLingo has been featured twice in The Knoxville News Sentinel! Once in a cover story called "Unravel A Teen's Web of Intrigue" and another time in a special report called "Faithful Blogger." NetLingo was featured in TriCities.com, the online version of The Bristol Herald Courier in a special report called "Online Lingo Risks Putting Kids in Dangerous Situations." NetLingo was featured in the Unicoi County TN Erwin Record of Tennessee in a story called "Tips on Teens' Use of Internet." The Globe Gazette in Iowa featured NetLingo in an article called "Text messaging is E123." Summit Daily News in Colorado featured NetLingo in an article called "Instant Messaging - The New Way to Chat." The Portales News-Tribune in New Mexico featured NetLingo and a list of Internet acronyms in an article called "The Text Generation." NetLingo was written up in Alaska in the Fairbanks Daily News Miner in an article called "However You Type the Acronym, It's OK with Me." NetLingo was referenced in the Leesville Daily Leader in a cover story called "Do You Know Where Your Children are in Cyberspace?" NetLingo was referenced in The Daily Record of Ohio in a cover story called "Cyber speak apparently destined 2b." NetLingo was referenced in The Times Herald-Record of Hudson Valley in a cover story called "School Will Revive Lost Art of Talking" when eighth graders realizing talking face to face was more uncomfortable than texting. NetLingo was featured in the Cayman Net News in a story called "Last Word: The Not-So-Secret Internet Text Messaging Lingo." The South Africa Sunday Independent featured NetLingo in a cover story called "Web Lingo Provides Juicy Epithets for IT Geeks." NetLingo was referenced in Business Day a division on the Business Media Company in South Africa, saying "Forget Evolution, NetLingo is a Language Revolution." Erin Jansen, Founder of NetLingo.com was interviewed by the Associated Press of Canada CP about online slang for an national article. Canadian Associated Press "Joining the In-Crowd means Learning the Lingo"
NetLingo was referenced in Monday Magazine's division of Black Press of Canada (with over 100 publications) in an article called "Curious Times: FYI"
NetLingo was referenced in The Globe and Mail, Canada's national newspaper, in a cover story called "How to Unravel a Teen's Web of Intrigue." Business Week featured NetLingo in an article entitled "Keeping Up with the Web's New Lingo!" NetLingo was featured in the magazine Good Housekeeping in an article titled "Decoding Cyberslang." They quoted Erin Jansen and told readers to visit NetLingo.com for help in understanding teen jargon. NetLingo was featured in the magazine Real Simple in their regular section called "Simple Solutions." They told readers to go to NetLingo.com to translate computer shorthand. NetLingo was listed as a "Top Surfing Destination" in Fortune Magazine. They said "Want to know the meaning an Internet term, this is the place to find out." Readers of PC Magazine consistently voted NetLingo as a "Top 100 Web Site" two years in a row! They said "One of the 100 Best Web Sites, it is a living dictionary devoted to the often cryptic and comedic vocabulary of the Internet, which is evolving at record speed." NetLingo was featured in the international edition of Reader's Digest about how to navigate the World Wide Web. They said "A comprehensive A-Z of every kind of Internet gibberish you are ever likely to encounter." They also said "Bookmark it now!" NetLingo was referenced in two separate issues of People Magazine! They said "IMHO, NetLingo.com's guide to jargon, acronyms and silly smileys is super! You might even catch a sighting of 5:-) (that would be Elvis)." Featured in Inc. magazine, NetLingo was in the cover story article called "Master of Your Domain." Bookmark It Now! A favorite of Fast Company, NetLingo was featured in a promotional mailers as it is one of Ellen Knapp's favorite bookmarks (Vice Chairman and Chief Information Officer for Coopers and Lybrand), thank you Ellen! NetLingo was featured in eBay magazine and supplies words and their definitions for the "Tech Terms" section. NetLingo was featured in Yahoo! Magazine each month for a year in their "EZ-User" section. NetLingo was continually referred to in Blink magazine by Earthlink, as the dictionary to go to when you need information such as acronyms and smileys. 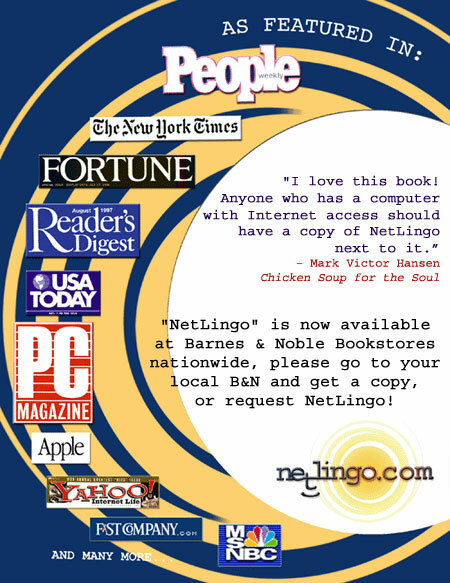 NetLingo is "an excellent resource for Net newbies" according to Red Herring. NetLingo was featured in Access Magazine, a syndicated insert in national newspapers. NetLingo was featured as "Best of the Web" in a cover story in Computer Currents magazine. They said we give "double fast relief from all of the online jargon! No acronym or phrase goes unexplained." TheBrandReporter.com featured the NetLingo logo as a leading brand in "Brands are Created In the Mind." YESSS! The 100 All-Time Best Web Sites -- "Cyberspace can be a strange and wondrous place - if you speak the language. Yet for those of you who think an applet is a jellied candy, it can be S-C-A-R-Y. NetLingo will save you from your ignorance. This site acts as an easy-to-use dictionary, with search and browse options for learning the Internet lexicon and making sense of the cyberworld around you. NetLingo offers regular updates that will keep you abreast of newly emerging technologies, and layman's terminology that will draw you in instead of driving you away." Rave Review in the Blue Pages -- "As the Web is woven, a new language emerges that those in the know use to communicate. Words and terms such as ISDN, daemon, and packet switching are examples of the specialized jargon of the online world. For both newcomers and long-time denizens, techno-conversations can be a Tower of Babel unless certain definitions are set down. That's where NetLingo comes in. A glossary defining hundreds of Internet related technical terms, NetLingo is searchable, hyperlinked, and elegantly simple. The definitions are clear and concise, with a More button for those who want to delve deeper. Finely designed and intelligently produced, NetLingo is positioned to be the semantics storehouse of cyberspace." Thank you David Pescovitz (now of boing boing)! NetLingo received a "Five Star: Best of the Web" by NetGuide. "NetLingo offers a comprehensive list of terms and definitions that contain a variety of links that draw upon the resources of the Web. Even hackers will appreciate the definitions pertaining to their own special vocabulary. Presentation is resplendent, and the information is orderly and easy to access." NetLingo got "Site of the Month" for Inside the Internet Magazine, now owned by ComputerWorld. "We think your site is a great resource! Keep up the good work!" NetLingo was reviewed in a weekly column in the Australian Brisbane News magazine. It was also reviewed in an e-newsletter and discussed on ABC Radio Brisbane! NetLingo was reviewed in a magazine called Lancet, a British Medical Journal (which is part of Encyclopædia Britannica). In a section entitled "Talk the talk" they want to keep doctors informed of online resources and acknowledge "NetLingo is a terrific site for users new to the net--or new to aspects of it, such as chat or website development. The centerpiece is its searchable dictionary of Internet terms, acronyms, and shorthand; the definitions are readable and comprehensive. NetLingo also boasts a "smileys" page :-), HTML tag library, a colouring book (try out Web page colours and copy the code), and IM shorthand. The pocket dictionary opens in a separate browser window and stays accessible as you surf." NetLingo was featured as a "valuable online resource" in the new book eMinistry: Connecting with the Net Generation. They said "Today's teens and children inhabit a wired world. This book helps church leaders respond to a generation that seeks spiritual guidance from Web sites and chat rooms." NetLingo was mentioned as an excellent resource in the book "Cyber Warrior: The Ultimate Manifesto For Internet Usage and Profiteering." NetLingo was featured in the book "What In The World Are Your Kids Doing Online?" Mobile Magazine tells readers to hop on over to NetLingo and find quite the range of Japanese smileys including the difference between a male (^_^) and female (^.^) smiley, a laughing smiley (^o^), a Cartman-esque angry smiley (>_<), and a sleeping smiley (u_u). Oh, and the one pictured on side there represents being in love (or fear). Erin Jansen with Mark Victor Hansen, author of "Chicken Soup for the Soul" series. MVH quotes "I love this book! Anyone who has a computer or Internet access should have a copy of 'NetLingo The Internet Dictionary' next to it." View the flyer! The Baltimore Daily Record featured NetLingo in a story called "Tech Talk: NetLingo can Translate Confusing Internet Terminology" saying NetLingo recognized the need for an online dictionary to serve as a reference for Internet users. NetLingo is featured in Texting 101 in the San Jose Examiner. Part of a two part series, it says "Ruok is not a Celtic rune but an abbreviated question that saves typing - Are you okay?. If you do not have a clue what it stands for, you’ll need backup; there is a good website, netlingo.com. Their acronyms are the largest list of acronyms and text message shorthand, and their dictionary defines most of the terms you need to know." NetLingo was featured in the Michigan Rosscommon Herald News in a story called "Text messaging world can be very confusing" as the place to go and learn about the variety of text messaging abbreviations and what each one means. NetLingo is featured in an EXTREMELY INTERESTING article about how the Internet is akin to the complex financial instruments devised by the financial world to inflate wealth: both were innovative, but once their everyday usage moves too far away from commonsense, they become destructive. A good read! NetLingo is recommended by Tina Meier, the mother of Megan Meier (of Megan's Law, see cyberbullying) as she educates middle and high schoolers and their parents that when you bring the world to your laptop or cell phone, you can open the digital door to those who wish to do you harm. NetLingo is referred to as the best place to see and learn what sexting codes are all about, in an article called "If you don't understand 'GNOC' please read this" in the Daily Herald of Suburban Chicago. It's an eye-opening article! NetLingo is among fine company, including Urban Dictionary, Wikipedia, and NoSlang, in this article called "How to Talk the Tech Talk" as featured in The Economic Times of India. NetLingo is part of innovative software program designed to translate text messages. The "Ruby Translator" converts text messages into words or words into text messages.